I remember one time in high school when a new girl transferred in the middle of the year. Everyone was talking about her, in part because she was new, and in part because she was really, really attractive. She ended up in one of my art classes, so I was interested to get to know her, and the fact that she was beautiful only heightened my interest. Tragically, it turned out that she was born without a personality. As nice as she was to look at, she had nothing interesting to say. You can still be friends with somebody like that, but you’re probably not going to date them, and you certainly aren’t going to marry them. Regardless of how physically attractive they may be, they must also engage you mentally and emotionally and spiritually. Your conversations have to mean something if you’re going to build a meaningful relationship together. Movies kind of remind me of discovering girls in school. There are lots of them to choose from, and they come in many different shapes and sizes and descriptions. There are beautiful movies and funny movies and intellectual movies. There are movies you flirt with and movies that make you laugh. There are movies you feel comfortable with and movies you fall in love with. 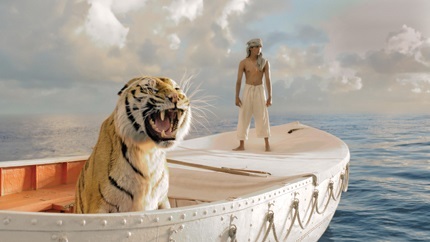 Director Ang Lee brought Yann Martel’s novel, Life of Pi, to the big screen. It is a gorgeous, visual cacophony of imagery and illusion that strives to unveil some deep and mystic revelation about life and truth. The truth is, however, that the great secret of this story is that the emperor has no clothes. Yes, it is very pretty. It has lots of shiny bits and pieces that tempt us into thinking that there’s something substantial there, but there isn’t. From a technical standpoint, it is a masterpiece of artistry realized through technology, and I give them full marks for presentation. But I want more than just pretty; I want a story that is full of truth, with characters I can care about, with ideas that challenge me. But there is no deeper truth than this: Life of Pi is a long movie about a boy on a boat with a tiger, and they try to survive without eating each other. Taken in pieces, there are moments of excitement and interest, but they ultimately amount to dross. At the end of The Wizard of Oz, the curtain is pulled back to reveal the real great and powerful wizard, who, by his own admission, was not really a bad man, just a bad wizard. At the end of Life of Pi when the curtain is pulled back, there’s nothing there at all. There are worse things that could happen in high school than eating lunch with a very pretty girl who is also a little dumb. But high school was a long time ago, and now I’d rather spend my time with people - and movies - that I care about more than for just the way they look. Life of Pi certainly does look good, but ultimately says nothing I’m interested in talking about.